Started the morning with a 1 mile jog. Later in the afternoon went with Sarah, the kids, and Steve Ashbaker to the South Fork of the Provo Canyon. The kids went sledding. Steve and I did the tempo run. 2.5 mile warmup, and then 3.23 miles from the start of Provo River Half-Marathon to the magic guard rail start in Vivian Park. That road gets ploughed very well, even during the heaviest snow storms. I am revealing the best kept tempo run during winter secret of the Utah County. Steve and I took turns leading a minute at a time. Steve is a great training partner. He always brings a doze of adrenaline to the workouts that I normally lack and is generous about sharing it with me. This keeps the pace fast. We got some nasty headwind and snow on the first repetion. Steve was very aggressive. At one point, he passed me to take his turn with such a zeal that he opened up a gap. I considered for a few seconds letting him go, but then realized he did not know where the finish was. So I shifted gears, and caught up to him. We ended up hitting the first one in 16:28. Steve was disappointed. All this effort for a 5:30 pace on a downhill course? I told him I normally do my tempo runs in those conditions in about 17:40, and it is not easy. He looked even more puzzled. He did not realize it was 3.23 miles, not 3, and the pace was actually about 5:07. There was another thing he did not realize - we were doing another repetition. We jogged back up, and agreed to go a little slower on the second one. This time, there was less headwind, and the sun came out. The pace felt very nice, very relaxed. We ran it in 16:51, an average of about 5:14. Not bad at all. Sarah picked us up at the Vivian park. 12.5 miles for the whole run. Ran with Benjamin and Jennifer in the evening, and did a little bit more of "always on the run" jogging to hit a total of 16 miles for the day. For some reason felt extra thirsty during lunch and dinner, and experienced a very pleasant feeling of freshness, fitness, and strength in the body. I think it is a good sign. Easy run with George and Eric in the morning. We did their fartlek - two sessions of 20 seconds fast 20 seconds slow 10 times. The idea is to shut down the slacking mechanisms by rebooting the body every 20 seconds and really push the cardiac output to the top. It seems like the workout accomplished its purpose - George and Eric were breathing pretty hard. However, after some jogging and dropping Eric off George was not done. He volunteered 1:43 quarter on a downhill, and then sustained about 7:30 pace once it flattened out. I challenged him to break 7:00 for the mile. He sped up to a 1:33 quarter and got 7:02. Afterwards, he wanted to do a couple of sprints. He is getting into a pretty good shape. We will find out how good on Thursday when we do the Slate Canyon Loop tempo time trial. I did a forced tempo pickup for my regular pitstop and clocked a 0.5 split of 2:51. The pace felt good, I enjoyed it. Did some always on the run miles during the day, and a run with Benjamin and Jennifer to total 13.5. I slightly injured my right foot on Friday. Fortunately, the pain is right in the middle on the very outside. My right leg is longer than my left, so I have to do some advanced acrobatics to compensate landing on the outside at an angle, and the aggressively rotating the foot inward to get the maximum power during the push. On Friday, my legs had a little bit more power than usual, the leg muscles fired quick and hard while the foot was still in the outward position and that caught it off guard, I suppose, and cause a minor sprain. I have been able to run at fast speeds, but it does hurt enough to annoy me and to affect the stride. So far I have tried ice with a small measure of success and B F & C with a greater. A doze of BF & C on the sore spot soothed the pain to about 50% of the original intensity and increased the range of painless motion by about 30%. I am going to try some more of that stuff. It would be nice if the pain went away before the Moab half, but I am not too worried - I can still race with it. Started the morning with a 1 mile jog before going to the temple. The foot was still hurting. I wondered if I should really do my scheduled 12x400. In the afternoon went to the Provo Canyon anyway. During the warmup, I figured out a way to plant my foot to minimize the pain. I decided to go ahead with the workout. Strong headwind, although I've seen it stronger. Again 12x400 downhill with 200 recovery. First one in 69.3. Others in the same range. A couple around 70.5 when the wind got stronger. After a few repetions the foot started feeling better. Always a prayer before each repetition and one after. This is the type of workout that makes me remember Alma 34:18-27 very vividly. Before the last repetition I notice that I need to run in 66.6 to hit the average of 69. Brigham Young once said that you should pray as if everything depended upon the Lord, but then work as if everything depended on you. I followed his formula. The head wind eased off a bit, I ran relaxed on the first 200, and gave it all afterwards to hit 66.5 for the split, and the desired 69.0 for the average. After the cool down I expected the pain in the foot to increase after the wear off of the endorphines, but it kept feeling better. Go figure. BF & C magic kicking in? The pumping of the blood cleared something up in the affected area? Maybe it is just time for it to start healing? I guess we learn from this that the next time you have an injury, 12x400 downhill is an effective treatment. In the evening ran with Benjamin and Jennifer, and a little bit more on my own to make the total 13 miles for the day. Starting the taper for Moab half today. The race is in two days. Ran easy 4.25 with George and Eric in the morning. George set a PR on his tempo run around the Slate Canyon Loop (2.11 miles) - 15:13. As usual, I had to make a pitstop, and ran a little tempo effort to open up a distance - clocked 0.5 in 2:50, felt a little sleepy. In the afternoon Benjamin wanted to run to the BYU Bookstore and back. Jennifer and Julia also wanted to come. So we took the stroller. Jennifer ran the first half-mile, Julia rode most of the way, Benjamin ran all the way at about 9:00 pace on flat sections and a little slower on the hills, and made me work. Julia weighs 33 pounds, Jennifer 41 pounds, our double stroller has a flat tire that I cannot get around to fixing, and you can really feel the hills with this kind of load. About 2.25 out, and the same distance back to give us the total of 4.5. Ran another 0.5 in the evening to make the total of 10.25 for the day. The foot is feeling better as the pain is gradually leaving. Taper before Moab half. Ran two Slate Canyon Loops. Did a pitstop acceleration, and a scheduled timed one (0.5) in 2:39. In the afternoon ran with Benjamin and Jennifer. Ran one easy mile in Moab. The foot is almost healed. Moab Half-Marathon. 1:15:58, 6th place. Mike Nielson won in 1:11:55, Joe Wilson second in 1:12:23. Then Ken Pliska 1:14:13, Mike Kirk 1:14:36, and Ewen North 1:15:03. I barely held off Neal Gassmann at the end - he finished with 1:16:03. The times were very slow, probably by anywhere between 2 and 4 minutes depending on your drafting opportunities due to extreme headwind for pretty much the entire duration of the race. The race started with a pack consisting of Joe, Ken, Mike Nielson, Mike Kirk, and myself hitting the first two miles in 5:27 and 5:21. At that point I felt my quads started cramping up a bit, I needed to back off. I had two choices to make - either try to go at faster pace with the pack and crash later, or be left in no-mans land. Unfortunately, at that point I did not realize how strong the headwind really was. Joe did, however. He tried to break away from the pack, but after five seconds changed his mind. So faced with the decision, chose a more conservative pace. Perhaps this was a mistake. Mike Kirk and Ken Pliska hitched a ride with Mike Nielsen and Joe to about mile 4, and then backed off. Being left alone, I could not break 5:45 for another 6 miles. Then Ewen passed me. He was going strong. I decided to hitch a ride, and got behind him. The wind weakened a bit, and we hit a 5:33, and then a 5:34. 10 miles in 56:44. If we do a decent 5 K, this could be a low 1:14. Not that great, but decent for the conditions. Ewen put on a surge at around 10.5 and dropped me, or maybe he just kept going, and I could not hold the pace. I did not really try that hard to stick with him thinking we were coming out of the canyon, and once we got into town there will be no wind. Oh, was I wrong! As we neared the end of Hwy 128, the wind intensified. The next mile was 5:58. I thought it could not get any worse than that. I was wrong again. We turned on Hwy 191, and the dust started flying in my eyes. The next mile was 6:45, and the competion ahead of me did not seem to be getting away very much if at all. Finally, the peak of the torment ended as we turned on 500 West, where we experienced a regular headwind. A lesson on learning to be thankful. I was really happy to have it, and be able to run somewhat normally again. Left turn on 400 North, and headed to the finish. As I turned, I saw Neal Gassmann out of the corner of my eye. This is trouble, as if I had not had my fair share already. 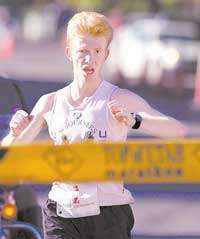 Neal in his young days ran a 14:08 5 K. He slowed down to 15:26 since then, but he still has the 14:08 kick. What do I do? Well, he has his kick, but he is tired, and he is far enough behind that if I start mine early he might hesitate for long enough for me to escape. It worked. Last mile in 5:48. After the race, almost everybody I talked to was depressed because of their slow times. However, there was no reason. Everybody ran about what I expected them to with the adjustment for the wind, except for Mike Nieslon and Joe. They beat the curve, possibly because they traded off leads most of the way. With the warm-up, cooldown, kids run, and always on the run miles, ended the day with 20 miles total. Running a 1:12:30 or so equivalent of a still air Moab course is all nice and good, but I need to do something different to move to a new level. The lab measurements of VO2 Max in 2004, as well as my intuition tell me the problem is severe lack of economy. I have been thinking about ways to improve it that are fundamentally different from what I have already tried. What I am after is a high power output while keeping the leg, especially the quad, muscles relaxed the maximum possible chunk of the stride cycle. I can relaxed them at low power, which is why I run well downhill with no headwind. Running downhill teaches relaxation, which is why my uphill running improves when I run downhill. Dumb uphill running makes me tense up, and I run worse in all directions. But downhill running is only a preparatory step. I need to have extensive practice running uphill relaxed for long periods of time. Here is one idea - run uphill for as long as a certain normally uncomfortable pace is sustained without tension. As soon as the tension comes, stop, jog to recover, then do a stride downhill to re-learn relaxation. Then try again.